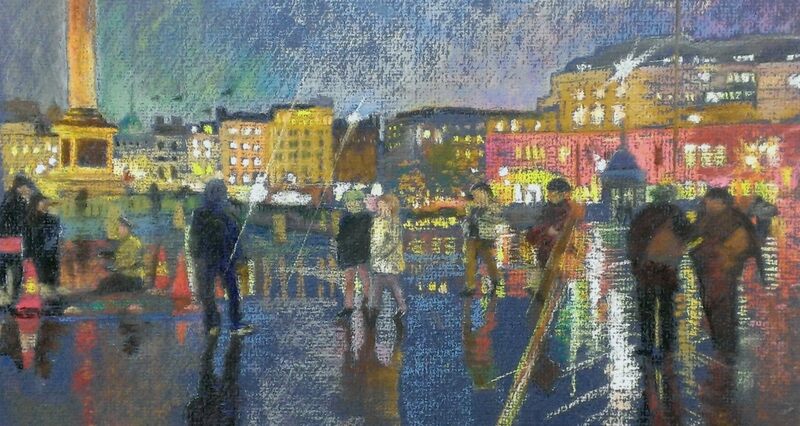 Now we are in February and my first 5 weeks of teaching about pastels in Trowbridge Town Hall is already finished. Much was learnt and all went away with pastel covered fingers and tables! The painting for the 50 Bees III Project is completed and at the framers, so will be ready for delivery on Friday, with the preview on March 9th. The Exhibition is at the Brewhouse in Taunton 9 March – 6 May. 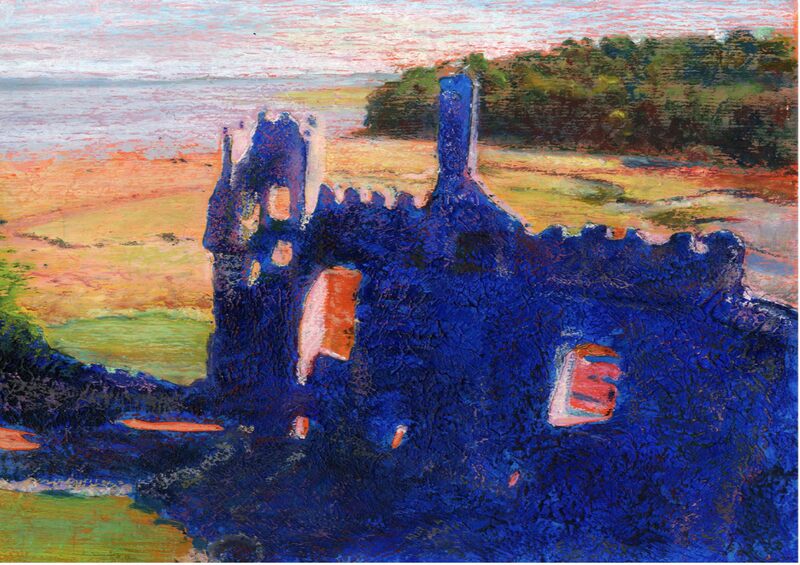 Two of my ruined castle paintings have been pre-selected for the RI Annual at the Mall Galleries. The Beaumont Gallery in Mere has asked me to join their group of artists and I will be concentrating on trees in the local landscape. One of my paintings has sold through First View Gallery, Stourhead where I will continue to exhibit from time to time, either ruined castles, packhorse bridges and scenes from the Stourhead Estate. Over the next few weeks I will be working on a large commission featuring three buildings from Cranmore set in autumn. The work for the Frome Open Studios, including setting up the entries in the brochure will continue and I will be considering paintings on a theme of Silver for the Somerset Art Weeks in September. Then I will be exhibiting with the Artists 303 Group in Taunton. There are a few Art Fairs along the way in Exeter, Frome and Poundbury, so much to do…… and I realise I have a number of existing paintings I would quite like to finish! Over the last few weeks I have finished some paintings. 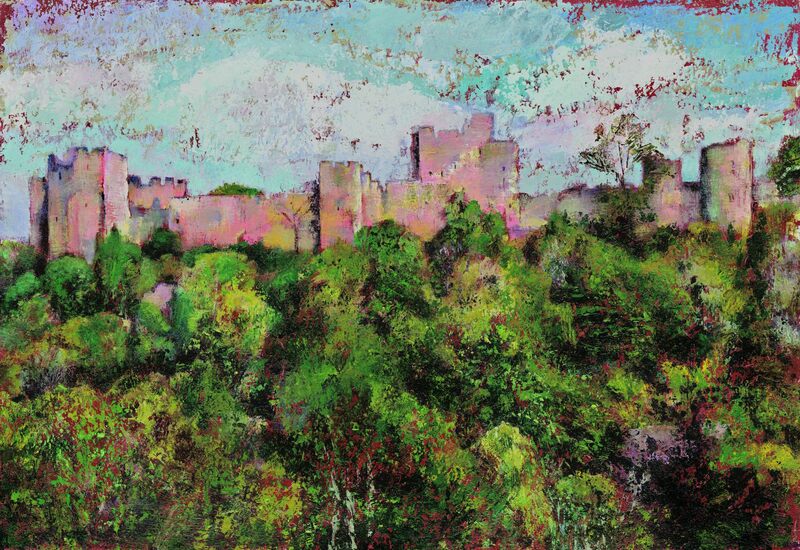 ‘High Power’ is of Ludlow Castle, commanding the River Teme from the high promontory. It was the first stone castle to be built in England around 1066. Harlech was built by Edward 1 in the late 13th century, and keeps watch over Snowdonia seeming to grow naturally out of the rock. One of the most formidable in an iron ring of fortresses though it was taken by Welsh leader Owain Glyn Dwr in 1404. 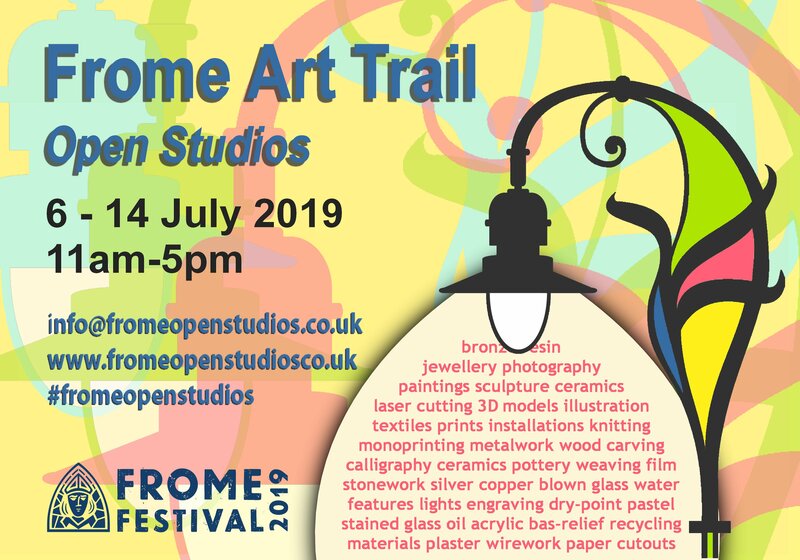 In between I have been working on the Frome Open Studios – updating the website with copy and a new theme for 2019. And having prepared a pastel drawing for my upcoming course ‘Urban Landscapes’ in January Trowbridge Town Hall, I am now ready to start work on a painting for the Fifty Bees project 2019! Looking back through the diary I see that I did little in the way of painting with more time online and in the garden. At the beginning of the month I finished the Somerset Art Works Open Studios at Batcombe Lodge where I enjoyed spending time with Moxi, and meeting many visitors. The Big Draw at Stourhead was a very cold rainy day unfortunately, though the artists set up their stations in the Gallery and enjoyed a day painting. I spent some time with a few members from the A303 group responding to a still-life of colourful items. So good to work and chat together. The Wokingham Art Group were happy to watch me demonstrating a painting in acrylics on board. 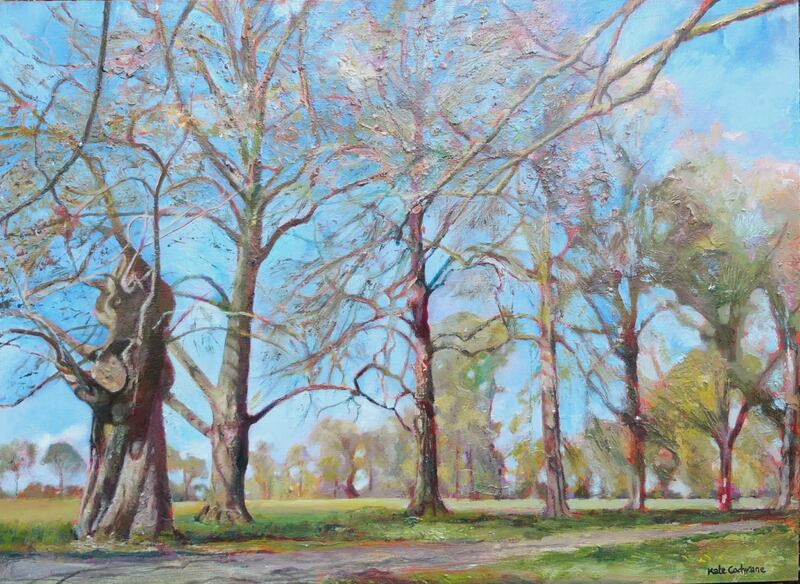 I took the subject of trees from a photo taken at the Hirsel Estate near Coldstream with beautiful pollarded willows in apricot oranges – there is a lovely write up which can be found on the Wokingham Art Society website. where you can see the colourful under-painting and the start of the actual painting! It is still waiting in a queue of half completed paintings though. 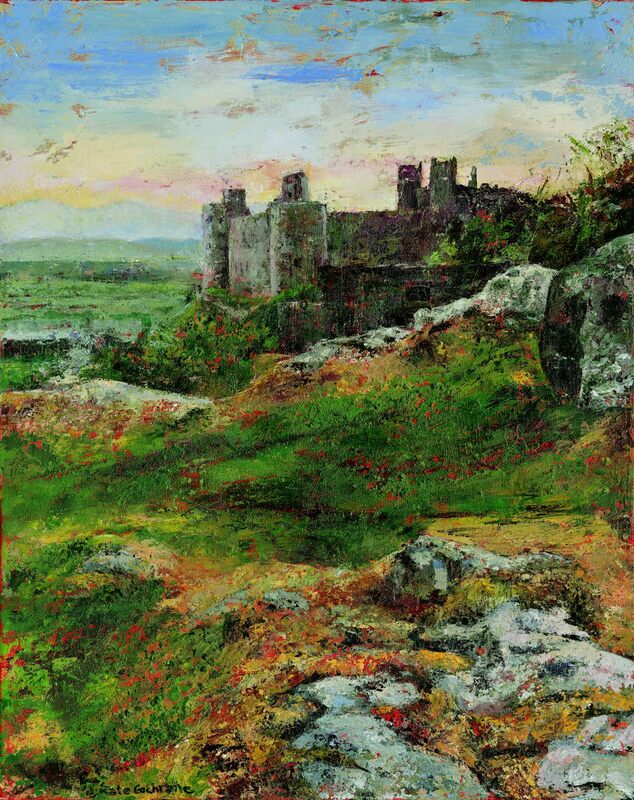 Planning to finish some paintings before starting on any new work – Harlech Castle with rocky ground is nearly done, then Ludlow Castle above the river…. 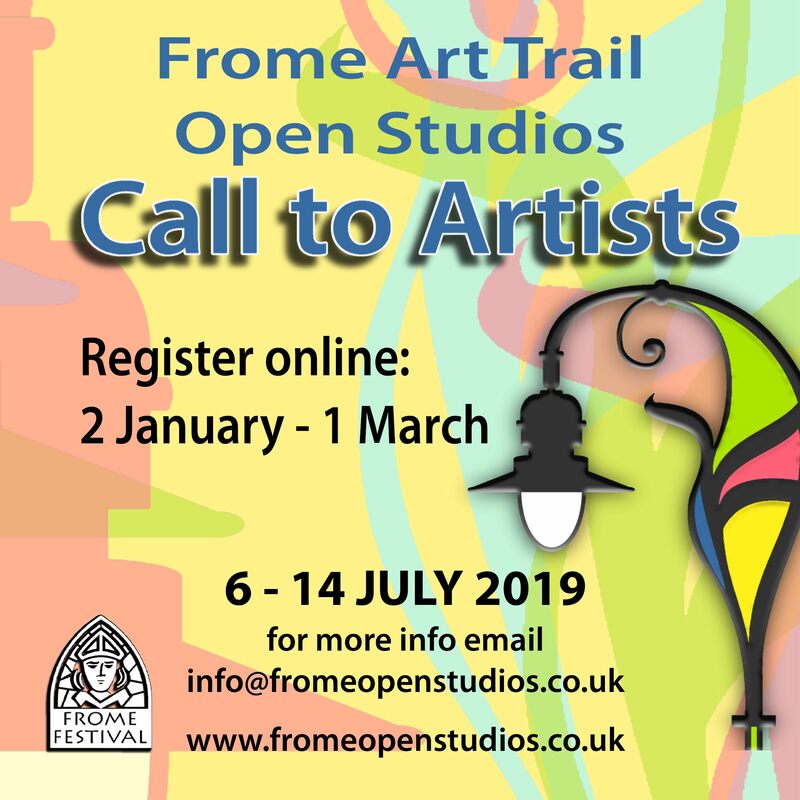 Meanwhile, my focus has been finding new team members to enable the Frome Open Studios to take place again next year during the annual Frome Festival. We have a good enthusiastic group so putting ideas forward for our 2019 new look. After a quiet August there is much to look forward to over the next few months! Firstly I am now at Batcombe Lodge for the Somerset Open Studios, Venue 159. 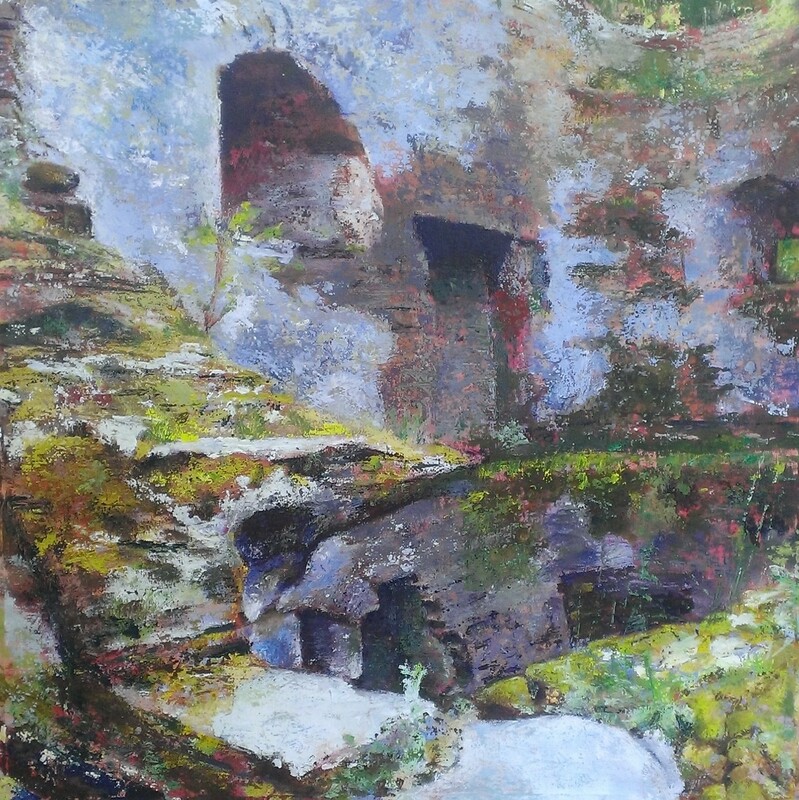 We have had some lovely visitors and I have managed to complete a painting – the basement of a watchtower at Berry Pomeroy Castle near Totnes. On 6th October I have been asked to be one of the artists taking part in The Big Draw at Stourhead. I will be stationed somewhere in the grounds and hope to sketch and paint the view, or work on an alternative view if we are in the gallery cos of rain! In October I am due to run a workshop for the Phoenix Art group in Bratton over 2 sessions using gouache with the theme of ruined castles. And with thanks to the local art scene I have been asked to do a commission for an Australian client. The request is for a large painting featuring her childhood home in Cranmore as she particularly liked my painting style. It will incorporate a few other buildings with autumn colours. Once finished I will need to take it off the stretchers to post to Australia! Also, I will be thinking of work to do for the A303 exhibition next year, plus I have been selected to do a piece for the Fifty Bees project 2019. 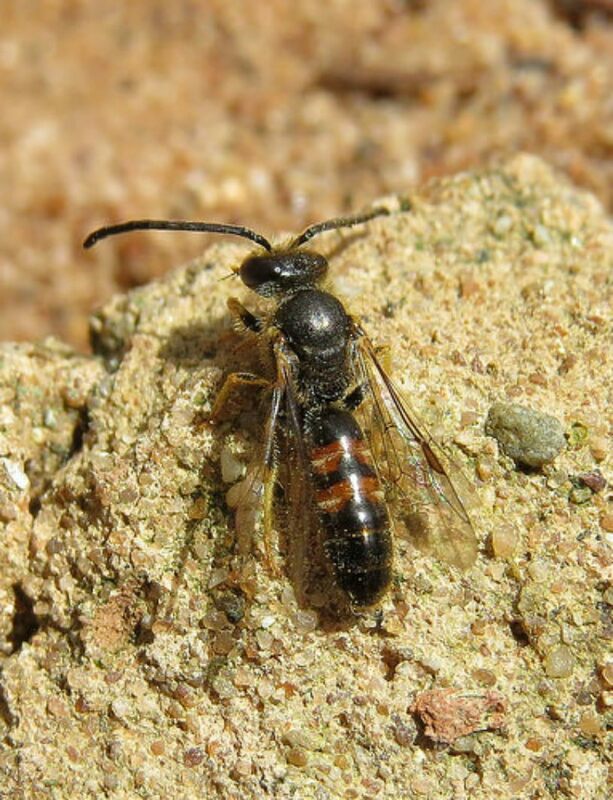 My given bee is the Broad-faced Furrow bees which live in soft cliffs from Seaton to Kimmeridge on the Jurassic Coast. We have been asked to do a piece based on the habitat or ecology of ‘our’ bee. August has been a quiet month in terms of painting – mostly been away and starting to sort and the studio. Anyone want a lot of pen nibs for drawing? Sorting the studio means finding unexpected items like a lot of oil crayons and a sketch sent to my grandmother from a Scottish artist Nancy Graham, plus far too many pencils and pencil crayons. And too many tables. All in preparation for the Somerset Open Studios: I will be at Venue 159, The Studio at Batcombe Lodge working alongside Moxi Lovegrove. I will be working on a few unfinished painting such as this one of a ruined tower interior at Berry Pomeroy, Totnes. I started it for an Art Demonstration last year and I think the group would like to see it finally finished! It is gouache on paper. I will show the process of my paintings from the first idea, research and various stages to completion. There will be drop-in mini workshops too in colour and composition using geometric shapes and coloured paper!! The Frome Open Studios went well with around 300 visitors calling in to see the artists and their work at the house. We had Bridget Beattie and Kristen Vincent’s paintings, Quentin Fleming’s metal sculptures in the garden, Wendy Wood showing her glass and Bill Grant’s pots. Despite the very hot first weekend, the Art Car Boot, Tennis, Football and a the Frome half-marathon we were impressed by the number of visitors! Two paintings were shown at the Ilminster Arts Centre in their Summer Open, now collected and waiting at home for another outing. Three are still at The Artizan in Torbay and I will go to see them on the last day before collecting them on the 17th August – unless they sell of course. Coming up is the Somerset Open Studios, 15 – 30 September with the theme of Process. I will be painting plus offering some hands on work at Moxi’s studio in Batcombe Lodge, Venue 159. June has flown by with preparing for the Open Studios in July as well as spending time away from home. I’ve done little painting apart from starting one or two paintings for Art Demos though. My painting ‘Ancient Routes’ was well received in Broadway and as unsold will be on show at the Frome Open Studios in July. Four paintings went into the Summer exhibition at the First View Gallery, Stourhead in June and maybe one or two will stay up during July and August. 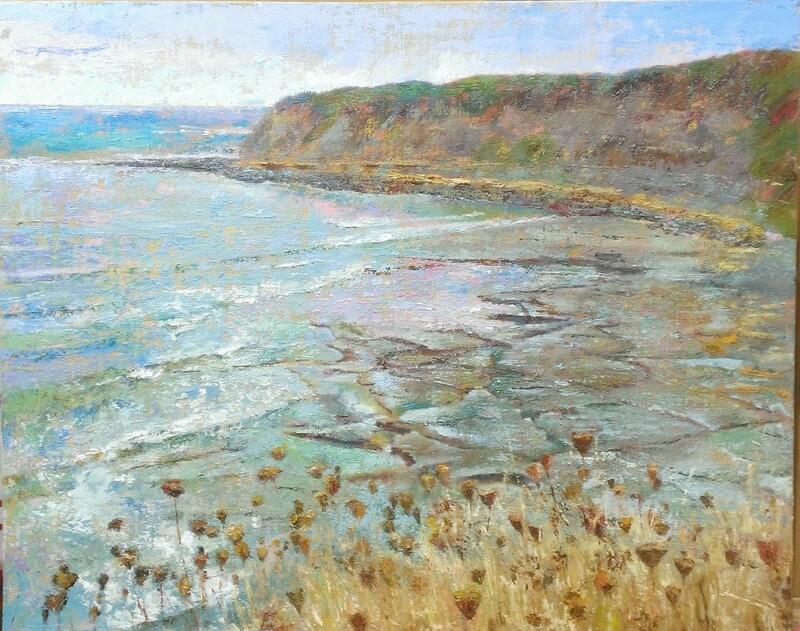 Meanwhile, 3 pieces of work have been accepted by the Artizan Gallery in Torquay for their Open Summer Exhibition 12th July – 16th August. This weekend is the last for Jason Nosworthy and myself at East Lambrook Manor gardens, We have enjoyed exhibiting in a beautiful setting with rapidly growing blossoms and blooms. The paintings have been well received with interest from a variety of visitors, and has opened opportunities for workshops and art demos too. Meanwhile one of my paintings was accepted for the Art Competition during the Broadway Arts Festival 8th – 17th June. Meanwhile, the brochure for the Frome Open Studios is out and ready to view online too..